The Oakland Raiders were at 3-3, having won for the first time in three weeks in their previous game, as they faced the 4-2 Steelers in Pittsburgh on October 20, 1980. Not much was expected of the Raiders heading into the season as they sought to retool following a 9-7 record in ’79 that caused them to miss the playoffs for the second straight season. QB Dan Pastorini had been obtained from the Oilers for the exciting, if erratic, QB Ken Stabler and he had gone down for the year with a broken leg two weeks earlier. 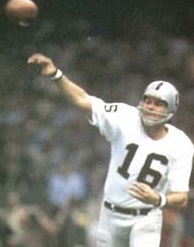 QB Jim Plunkett (pictured above), once a highly-touted prospect with the Patriots who had become a forgotten backup in Oakland, was now behind center. Castoffs and savvy veterans were filling out the roster (a typical occurrence over the course of the franchise's history) and beginning to show results under second-year Head Coach Tom Flores. Pittsburgh was coming off of back-to-back NFL titles in 1978 and ’79, the third and fourth under Head Coach Chuck Noll. But injuries had knocked starters out of the lineup at running back (FB Franco Harris) and wide receiver (Lynn Swann and John Stallworth). QB Terry Bradshaw was still formidable but other veterans were showing their age, particularly in the once-proud defensive unit. The Steelers were upset by the Bengals the previous week. It was a cool, partly cloudy Monday night at Three Rivers Stadium with 53,940 fans in attendance. The Steelers had the first possession and drove 69 yards in six plays. Terry Bradshaw started off with passes to WR Theo Bell for 15 yards and FB Greg Hawthorne for 16. Another completion to Bell picked up 21 yards and was followed by a throw to WR Jim Smith in the end zone for a 19-yard touchdown. Matt Bahr added the extra point and the home team was ahead by 7-0. On Oakland’s first play from scrimmage, HB Kenny King fumbled and SS Donnie Shell recovered to give Pittsburgh the ball at the Raiders’ 19. HB Rocky Bleier ran for 12 yards on first down and, while the Steelers were unable to reach the end zone, Coach Noll declining to not run a play on fourth down with less than a foot to go, Bahr kicked an 18-yard field goal to extend the lead to 10-0. A short kickoff return had the Raiders starting their next series at their own 15, but a pass interference penalty advanced them 39 yards and the six-play, 85-yard drive ended with King running around end for a 27-yard TD. Bahr converted to make it a three-point game. To make matters worse for Pittsburgh, MLB Jack Lambert left with strained knee ligaments, removing a key player from the defense. The teams traded punts until the Steelers, in a series that extended into the second quarter, drove 84 yards in ten plays. Bradshaw (pictured above) threw to Smith for a 25-yard gain on first down and Hawthorne followed up with a 13-yard carry. Hawthorne and FB Russell Davis pounded away, with Davis gaining three yards in a fourth-and-one situation at the Oakland 37, Bradshaw passed to TE Bennie Cunningham for 15 yards, Davis ran for another 12, and after Hawthorne ran around end for six yards, Davis dove into the end zone from a yard out for a touchdown. Bahr’s PAT put the home team ahead by ten points once again at 17-7. The Raiders again had to punt following their next series, but they got the ball back in short order when LB Ted Hendricks intercepted a Bradshaw pass. Starting from the Pittsburgh 39, it took the visitors seven plays to score. The key play along the way was a Plunkett throw to WR Bob Chandler for 37 yards to the one yard line, and while the Raiders stopped three consecutive running plays, FB Mark van Eeghen reached paydirt from a yard out on fourth down. Bahr again converted and the score was 17-14. The Steelers were backed up by a holding penalty to start their next possession but got a first down on a Bradshaw completion to Cunningham for 21 yards and a pass to Bell gained another 16. But on a third down play near midfield, Bradshaw fumbled when sacked by DE Cedrick Hardman. DE Willie Jones recovered for Oakland and lateraled to LB Rod Martin, who ran 34 yards for a touchdown. Bahr added the point after and the Raiders were in front by 21-17. Backup QB Cliff Stoudt replaced Bradshaw, who had a bruised shoulder, and his third pass was picked off by Hendricks to give Oakland the ball at the Pittsburgh 49. Three plays later, Plunkett connected with WR Morris Bradshaw for a 45-yard TD. Bahr kicked the extra point and the visitors were now ahead by 28-17. The Steelers got the ball with 1:17 remaining in the first half and advanced 79 yards in seven plays. Stoudt passed to Bell for 26 yards, Hawthorne for seven, and Bleier for 17 yards and finally to Smith for a 13-yard touchdown. Bahr’s conversion made the halftime score 28-24 in favor of the Raiders. The Raiders wasted little time extending their lead in the third quarter, driving 75 yards in five plays. Plunkett connected with WR Cliff Branch (pictured at right) for a 56-yard TD and, with Bahr’s extra point, Oakland was ahead by 35-24. Terry Bradshaw was back behind center for the Steelers and they responded by going 68 yards in 11 plays. Bradshaw converted a third-and-10 situation by throwing to WR Calvin Sweeney for 19 yards and hit Smith for 15 yards on a third-and-11 play. The series ended with another Bradshaw pass, this time to Bell for a 36-yard touchdown. Bahr’s conversion made it a four-point game once more. 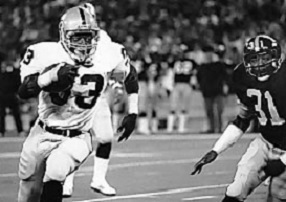 The Raiders, with van Eeghen and King primarily running the ball, drove into Pittsburgh territory, but van Eeghen fumbled at the 37 and LB Robin Cole recovered and ran to the Oakland 49. Bradshaw was sacked on first down for a loss of six yards but came back with a pass to Cunningham for 15 yards and a personal foul on Hardman for roughing the quarterback advanced the ball further, although it necessitated Stoudt coming back into the game for two plays. After reaching the Oakland 15, two Bradshaw passes into the end zone fell incomplete but Bahr booted a 32-yard field goal to make it a one-point contest at 35-34. The Raiders had the ball as the fourth quarter started and drove 82 yards in eight plays. Plunkett completed a pass to TE Raymond Chester for 11 yards and had back-to-back throws to Branch for 13 yards apiece. One more pass to Branch resulted in a 34-yard touchdown and, with Bahr’s kick, the visitors had an extended lead of eight points at 42-34. A short series by the Steelers resulted in a punt and Oakland, taking over with 8:41 on the clock, put together a 14-play, 35-yard drive. The Raiders converted two fourth downs along the way and HB Arthur Whittington carried most of the load on the ground. Bahr kicked a 36-yard field goal with 58 seconds left in the game to nail down the 45-34 win. The Steelers had the most total yards (467 to 390) and first downs (27 to 20). However, Pittsburgh turned the ball over three times, to two suffered by the Raiders, and hurt themselves with 10 penalties at a cost of 115 yards, to five flags thrown on the visitors. 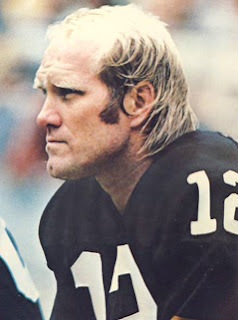 Oakland also accounted for five sacks as they battered Terry Bradshaw, who had to leave the game three times, while the Steelers registered none. Jim Plunkett completed 13 of 21 passes for 247 yards with three touchdowns while giving up no interceptions. 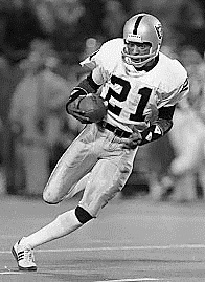 Cliff Branch was the primary recipient with five catches for 123 yards and two TDs. Kenny King (pictured below) rushed for 70 yards on 14 carries that included a score and Mark van Eeghen contributed 52 yards and a TD on 18 attempts. For the Steelers, Terry Bradshaw was successful on 18 of 27 throws for 299 yards and two TDs while giving up one interception. Jim Smith caught 6 passes for 102 yards and two touchdowns and Theo Bell gained 114 yards on his five receptions that included one TD. Russell Davis led the team in rushing with 51 yards on 9 carries and Greg Hawthorne gained 38 yards on 12 attempts with one score and also caught four passes for 46 yards. Oakland lost only twice more the rest of the season, putting together an 11-5 record that placed second in the AFC West and secured a Wild Card playoff spot. The Raiders went on to reach the Super Bowl, becoming the first Wild Card team to win. As for the Steelers, the loss to the Raiders was viewed as a major sign that the Pittsburgh dynasty was coming to a close, even though they remained in a tie atop the AFC Central. They lost again the next week, rallied to win three straight games, but split the remainder to end up at 9-7 and out of the postseason for the first time since 1971. Jim Plunkett received Comeback Player of the Year honors from the Associated Press as he passed for 2299 yards and 18 touchdowns while the club went 9-2 with him behind center in the regular season. He capped the year by being named Super Bowl MVP.